Alas my usual fruit, yogurt and granola breakfast has been replaced with a less seasonally dependent breakfast. This one’s a keeper. Using frozen berries you still get a good serving a fruit in your morning meal, old-fashioned oats provide good complex carbs, and milk provides good calcium and protein. It’s a perfect combo for a filling morning meal. There’s not much sweetener in this, so if you like a sweet breakfast either up the sugar while you’re making it, or top it with a drizzle of honey or maple syrup. The best part? 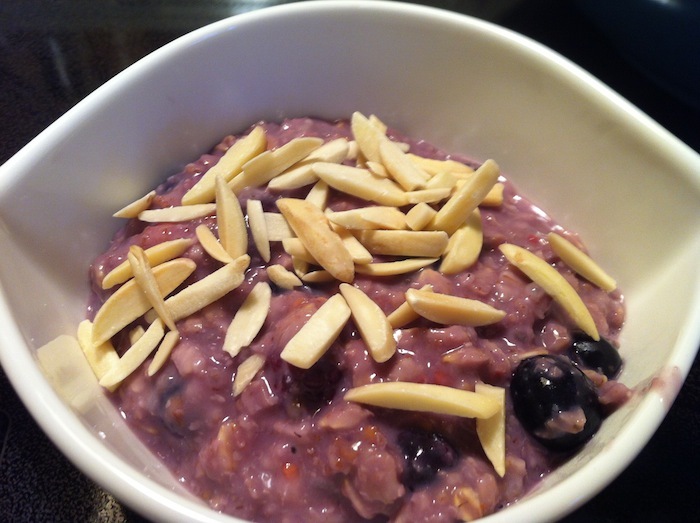 You get to eat purple for breakfast! Who doesn’t love fun colored food? In a pot, combine oats, milk, coconut milk, sugar, and wheat germ. Bring to a boil and stirring occasionally cook for about 10-15 minutes until liquid is absorbed. Add in the egg whites, frozen fruit and vanilla and stir. Heat through and then serve. Sprinkle with toasted slivered almonds if desired.